Rangoli Rekha is Zynga’s first India-themed puzzle game that features “rangolis” – mesmerizing, colorful patterns drawn on floors of Indian homes. The game follows the adventures of Rekha, a girl who loves colors. But her teacher hates them punishes her for drawing rangoli designs on her scrapbook. In her dream she recreates her colorful world, but her teacher, in the guise of an evil maharaja, turns everything black and white. You must help Rekha restore a boring colorless place into a bright, lively world and complete her scrapbook. To make this possible, you will have to solve exciting match-3 puzzles. You can create a rocket when you match 4 designs in a row. The rocket clears a row or column when you tap it. But instead of tapping a rocket, you can swap it with a design if you want to clear an adjacent row or column. If the nose of the rocket points upwards, it will clear a column and if the nose points to the right/left, the rocket will clear a row. You can swap a rocket with a rangoli design when you see that the adjacent row or column contains designs required to complete an objective. Simply tapping it without properly examining the game board would be as good as wasting a move. A chakra clears designs in a square. You will have to make an L-shaped match to make a chakra. The animated chakra whirling looks great on smartphone. You can make the most out of this power-up if there are butterflies surrounding it. Butterflies are not easy to get so make sure the chakra is close to them and they are within its range. The power-up does not activate unless you tap it or swap it with an object. When you see butterflies in close proximity to the chakra, simply tap to activate it. 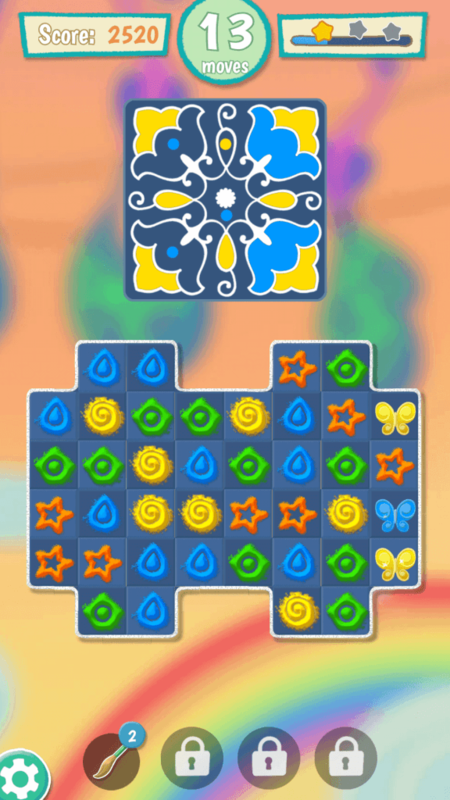 To create “Bijli”, you will have to match 4 same-colored designs in a square. Tap this power-up and a random design will be removed from the game board. The design that’s removed from the game board would probably be one of those that need to be cleared to complete objectives. This power-up is not quite useful, but still you can be rest assured that it will have some contribution in completing your objectives. Rangoli Rekha’s Flowerpot power-up works just like the rainbow power-up. You just have to swap it with a design and all designs of that color will be removed from the game board. So if you swap it with green, then all green designs will be cleared. To create a flowerpot, you must match 5 designs of the same color. This power-up can be very useful in removing certain designs that are scattered all over the game board. It will certainly help you complete your objectives, especially those that require players to collect an “X” number of designs. Combine two rockets to get a plus-shaped explosion, which will clear a row and column at once. Combining a rocket with Bijli will create a duplicate rocket. It will move to a random spot on the game board. You will now have two rockets ready for action. Hint: You will get similar results when you combine Bijli with a Chakra. Combine flowerpot with rocket to have several rockets scattered all over the game board. They will be activated automatically and remove several designs at once. Now try combining a flowerpot with a chakra or Bijli if you want to complete objectives faster. Have you completed a level with several moves remaining? Congratulations! You have actually created several power-ups that can help you get 3 stars and reach a high score. Unused moves convert into power-ups, which are then randomly placed on the game board. They are activated automatically, helping you score more points. Having several unused moves can be very useful if you are aiming for three stars in Rangoli Rekha. 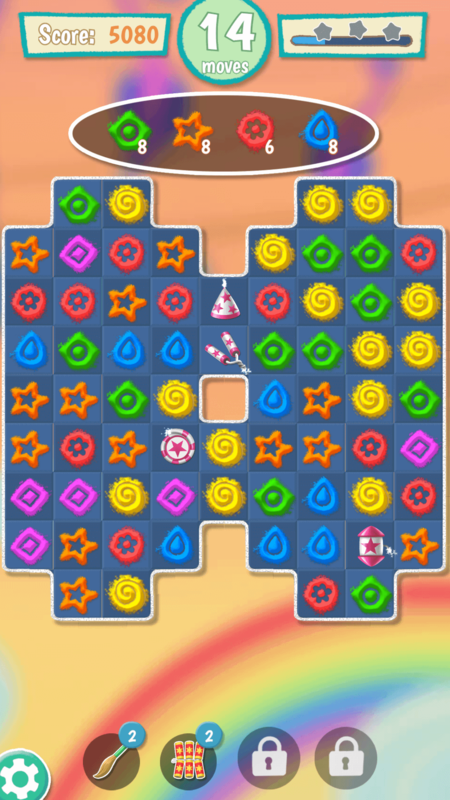 The more the number of unused moves you have in a level, the more power-ups you will see on the game board. Out of lives? Well, you can spend in-game coins to get some bonus lives, so that you can continue from where you left off. The game provides 4K coins, but you can get more coins without paying a dime. You can connect to Facebook by tapping the “Login” button or watch promos to get free coins. On your map screen, tap the coin icon to watch a thirty second video and get 100 coins.